I read this article and found it very interesting, thought it might be something for you. The article is called Spaghetti Quiche with Roasted Asparagus and is located at https://www.anediblemosaic.com/spaghetti-quiche-with-roasted-asparagus/. After a long, cold winter I look forward to seeing asparagus abound in the market…it means spring is here! When asparagus is in season I’m always looking for new recipes to use it in, so when Natasha announced that this month’s 5 Star Makeover Challenge was pasta, I knew I wanted to incorporate asparagus somehow. Quiche came to mind and I envisioned a golden spaghetti crust filled with a light quiche and roasted asparagus, and topped with bubbling cheese. The crust didn’t turn out as planned…the spaghetti wasn’t golden or crust-like. Instead, the pasta incorporated into the quiche filling (think spaghetti frittata). I think next time I’ll precook the spaghetti in the pan in the oven to crisp it up a bit before I add the filling to see if that helps at all. Despite this, it was still a completely delicious and satisfying spring meal. I’m sending this recipe to Natasha of 5 Star Foodie for her 5 Star Makeover Pasta Challenge! Roasted Asparagus: Preheat the oven to 425F. Wash the asparagus and pat it dry. Snap off the tough ends (save them for vegetable stock if desired) and arrange the asparagus in a single layer on a baking sheet. Drizzle with the olive oil and sprinkle with salt and pepper, then use your hands to roll the asparagus around so it’s evenly coated with oil, salt, and pepper. Bake for 8-10 minutes, giving the pan a shake halfway through cooking. The asparagus is done when it’s golden brown in places and fork-tender. Allow the asparagus to cool slightly, then cut into bite-sized pieces (about 1-inch long). Prepare the spaghetti to al dente according to the package directions. In a blender or food processor, process the cottage cheese and milk until smooth. Pulse in the eggs, egg whites, and a pinch of salt and pepper until combined. Turn the oven down to 350F. Grease the bottom and sides of a 10-inch oven-safe frying pan with butter. Spread the spaghetti on the bottom of the pan, then sprinkle the asparagus on top. Pour in the egg mixture evenly over the asparagus and spaghetti, sprinkle on the cheese, and arrange the tomato slices on top, pressing them down slightly. Bake for about 40 minutes until the quiche is set and the bottom and sides are golden brown. Does not matter! The quiche/frittata sounds excellent no matter how you slice it! No matter what you call it,it looks yummy. I actually love that you incorporated the spaghetti in the quiche, it sounds fantastic and it’s a terrific entry for the 5 star makeover! What a clever idea! It looks really delicious! Lovely flavors. I have been eating asparagus so much lately too…I love it and love your delicious recipe. As always, it looks amazing and is so creative! I think pasta frittata/quiches like this are just so delicious. There’s something about all of the cheesy goodness that is just so fantastic. I’m loving asparagus as well! You made a great choice to add it into this dish. Faith…you won my cookbook giveaway! Please email me at bsmithw@gmail.com and give me your mailing address. Congratulations! I have not made a quiche. This looks very delicious to me. Must try some time. Gorgeous quiche. 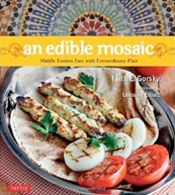 Truly an Edible mosaic. Great job. Cheers! This dish looks and sounds delicious! Wow! This looks incredible and completely unique! I’m trying to think if I have an appropriate-sized skillet that’s over-safe at home to make this! Delicious! Asaparagus quiches made with spaghetti crust is awesome. It’s really creative too. Nice! It sounds delicious and looks so pretty the way you’ve decorated the top. Beautiful, creative, and healthy. I love asparagus and I love this quiche idea! This sounds wonderful! I love the spaghetti in it. YUM! Yes, if you want to make the crust crunchy you def have to preccok it and make it crispy in a pan… my mom makes a similar dish and that’s how she makes it. Regardless, your quiche looks fantastic! wow …i’d love to try the spagetti quiche…looks delicious!!!!! !